California cities and water utilities will be stressed to meet the state’s aggressive urban conservation mandates in this fourth year of drought. Following Gov. Jerry Brown’s executive order, the State Water Resources Control Board developed specific reduction targets for each major urban water supplier, ranging from 8 percent to 36 percent of per-capita water use in 2013. The proposed “emergency” cutbackswould take effect as early as June 1 and last nine months, to Feb. 28. For most cities, 2015 will be the first year in the four-year drought that deeply affects them; it has been mostly an environmental and agricultural drought until now. Statistically, a fifth dry year seems likely. If the urban water-use reductions were imposed gradually over a longer period, they could be achieved through changes in plumbing and building codes, landscaping ordinances and water pricing. But for urgent drought conservation this year, such measures are unlikely to yield enough water savings. Well-motivated voluntary conservation efforts will help, but not by much — usually 5 percent to 10 percent reductions use, as seen last year. For this year, many California cities will look to water rationing, particularly those facing reductions of 15 percent or more. 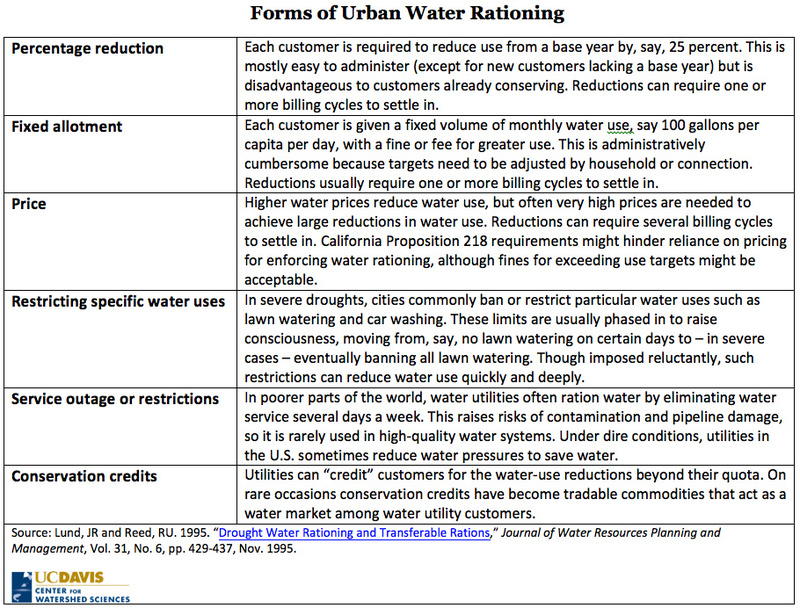 Some common forms of water rationing are outlined in the table below. California began serious urban water conservation during the 1976-77 drought and expanded these efforts during and after the 1988-92 drought. The rapid imposition of substantial statewide reductions this year will shape urban water conservation for years to come. The reductions will make water available for cities in the future, as well as for the environment and agriculture. But they will also pose challenges for wastewater systems designed for higher flows. The substantial reductions this year, and likely next year, will have major financial and rate-making implications for local water utilities, which are the financial and innovation backbone (or perhaps exoskeleton) of California’s decentralized water system.